Availability : We depart almost any day with 2 people. Not available in February. Not recommended Dec-Mar. This unique six day Salkantay Trek to Machu Picchu takes you on a less traveled path around the sacred Salkantay mountain (6271m / 20,569 ft), one of the highest and most stunning in the Peruvian Andes. After passing through Quechua-speaking communities and lesser-known Inca ruins, we join up with the Classic Inca Trail to Machu Picchu, that world-famous trek that is on everyone’s bucket list! 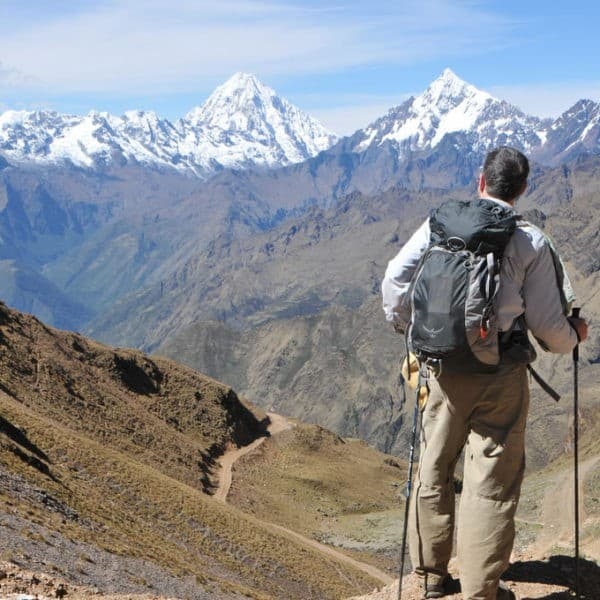 Get the best of both worlds with this trek – the stunning, high mountain trekking experience of the Salkantay Trek to Machu Picchu and the impressive ancient Inca ruins and mystique of the famous Classic Inca Trail. Did you know? 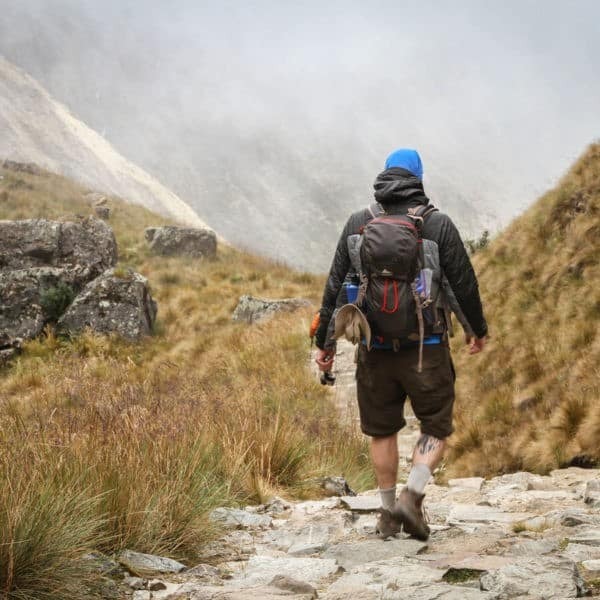 Only a special few actually get to hike the Inca Trail every year. 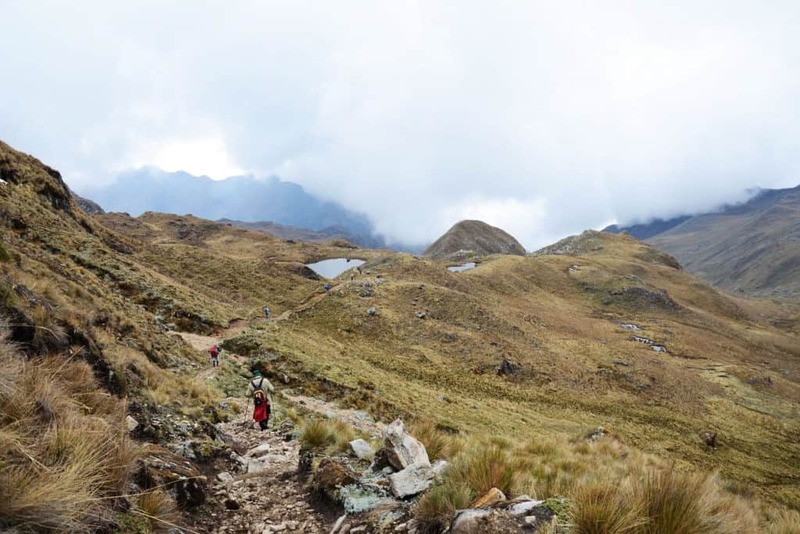 Peru’s permit system means that just 500 people are allowed on the trail every day – approximately 200 visitors and 300 trekking staff. Permits are sold on a first-come, first-served basis, and are in very high demand: they can sell out as much as 6 months in advance. Once spaces have been booked, NO OPERATOR CAN OFFER YOU A SPACE. All spaces are personal and non-transferable, and there is no waiting list, so if someone cancels, their spot cannot be taken by someone new. 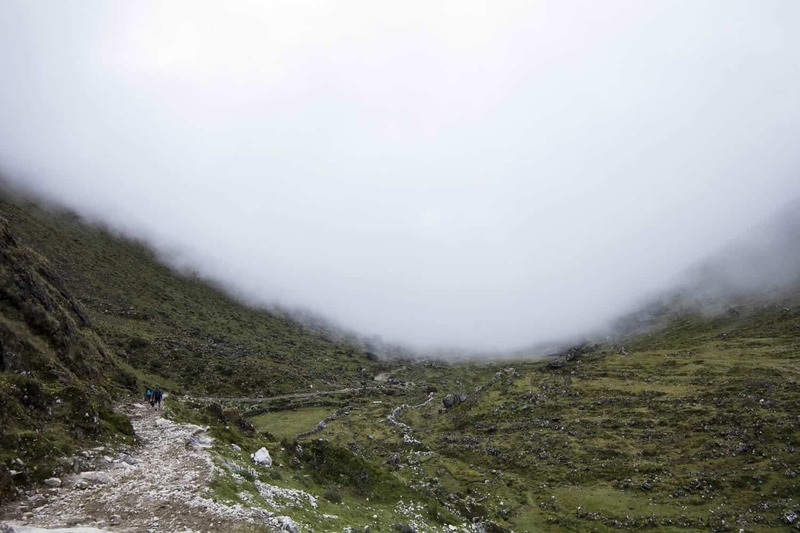 Also note that the Inca Trail is closed in February for maintenance. Stunning mountain vistas, snow-capped peaks, and impressive Incan archaeological sites await you on this Salkantay trek to Machu Picchu, including none other than the enigmatic Incan citadel itself! Temperatures will vary widely on this trek, from below-freezing to semi-tropical, so make sure you are well prepared! Toilet tent is included for first 2 days of trek only. Toilet tent is NOT included along the Inca Trail part of the route, because we use facilities provided by the Ministry of Culture. Entry to Huayna Picchu or Machu Picchu mountain. if you don’t have one with you. Sleeping bags good to at least -15˚C are recommended. See What To Bring for our comprehensive recommendations on what to pack for your trek. Note that there will be significant temperature fluctuations on this trek. Some of the campsites are particularly cold, but it will be much warmer the nearer we get to Machu Picchu. Make sure you have enough very warm layers with you, but also be prepared for warmer temperatures! For more great suggestions, check out our blog about How to Prepare for a Trek in Peru. 5% off the second trek, if you book two treks or two tours. 5% is discounted from the cheaper of the two treks or tours; only one trek is discounted. Note: Trekkers Wanted ONLY available while permits last for your departure date. Wiñaywayna vs Phuyupatamarca campsites. Your last night on the trail will be spent either at Wiñaywayna or Phuyupatamarca campsites. Many people covet Wiñaywayna as it’s just a 2-hour hike to Machu Picchu from there, whereas it is 5 hours from Phuyupatamarca. Being the most popular, Wiñaywayna is allocated first. If you have your heart set on camping at Wiñaywayna, book early! The plus side to Phuyupatamarca is that it is generally less crowded. If you booked the Inca Trail at a student rate, you must bring your valid student card on the trail with you. If you do not present your student card, you will not be allowed to start the trek and you will not be entitled to a refund, nor given an opportunity to pay the full rate. 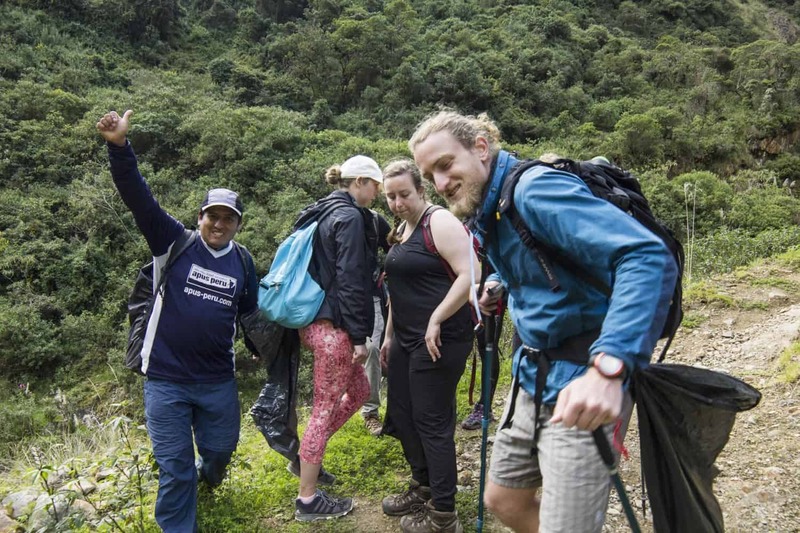 This trek includes transportation by train from Aguas Calientes to Ollantaytambo on the Expedition service (Tourist Class), followed by bus transport from Ollantaytambo to Cusco. If you’d like more flexibility in your return travel to Cusco, consider upgrading to the Vistadome train (Executive Class) for an extra $30 per person. This upgrade must be requested at time of booking. After an early breakfast in your hotel, we will pick you up to start our 2.5h journey to Mollepata, the traditional starting point for Salkantay trek. Here we’ll have a chance to pick up some last minute supplies or have a quick bite if you missed breakfast, and then we’ll continue another 1.5h by car to Soraypampa (3800m / 12,464 ft). We will have lunch while marveling at Humantay’s impressive snowy peaks (5850m / 19,193 ft). After lunch, we’ll hike for about 4hs to our campsite at Ichupata. This is an especially cold and high altitude campsite, so make sure you’re well acclimatized and that you have enough warm layers to bundle up in! After a cold night, we continue our hike past Abra Salkantay to start the 3-4h steep climb towards the Incachiriasca (4965m / 16,289 ft). This is the highest point on this route and it offers impressive views of Salkantay’s snowy peak. After a celebratory lunch and rest, we will start our descent towards our camping spot at Sisaypampa (4200m / 13,779 ft), a flat area from which we can observe the Salkantay’s neighboring valleys. With any luck, we may even have a chance to spot some condors! *If we camp at Sisaypampa, we can make a short detour to the Palqay Pass, which has an altitude of 4500m / 14,764 ft and offers a different view of Salkantay mountain. *Depending on Inca Trail permits and campsite availability, we may continue on to Pampacahuana instead. See Day 3 for more details. This morning we will descend for about 3.5h to Pampacahuana community (3700m/12,139 ft), located next to an original Inca canal. 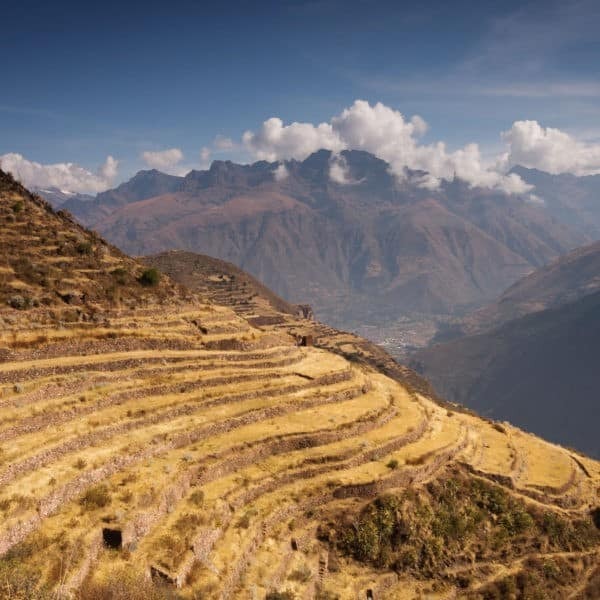 The Incas frequently cut canals through valleys to increase the usable agricultural land. From Pampacahuana, it’s a 1-2h hike down the narrow, steep valley to the Inca fortress of Inkaracay (also known as Paucarcancha). This is a site well worth exploring and little known to the vast majority of visitors to Peru. From here, we continue another hour to the small village of Huayllabamba where we will join up with the Classic Inca Trail to Machu Picchu. As mules are not allowed on the Classic Inca Trail, we will say goodbye to our mules and muleteers here and welcome our porters who will accompany us for the next few days. 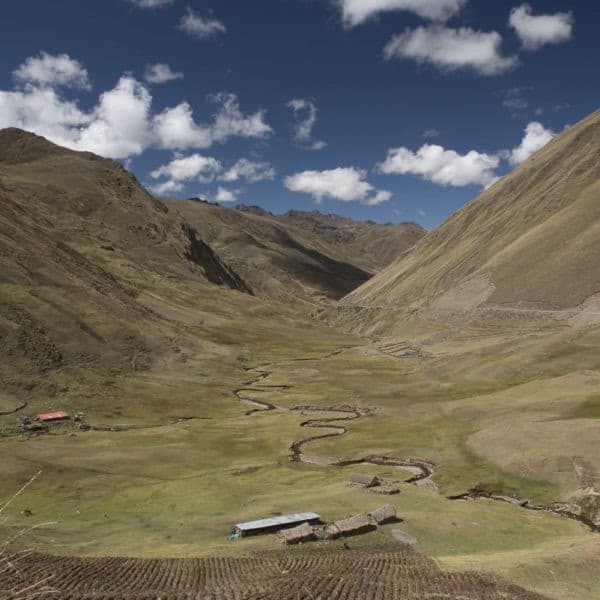 *Depending on Inca Trail permits and the campsites that the Ministry of Culture allocates to us, we may need to hike another 2h to Llulluchupampa (3800m / 12,467 ft). If this occurs, it is likely that we will spend Night 2 at Pampacahuana campsite, instead of Sisaypampa. 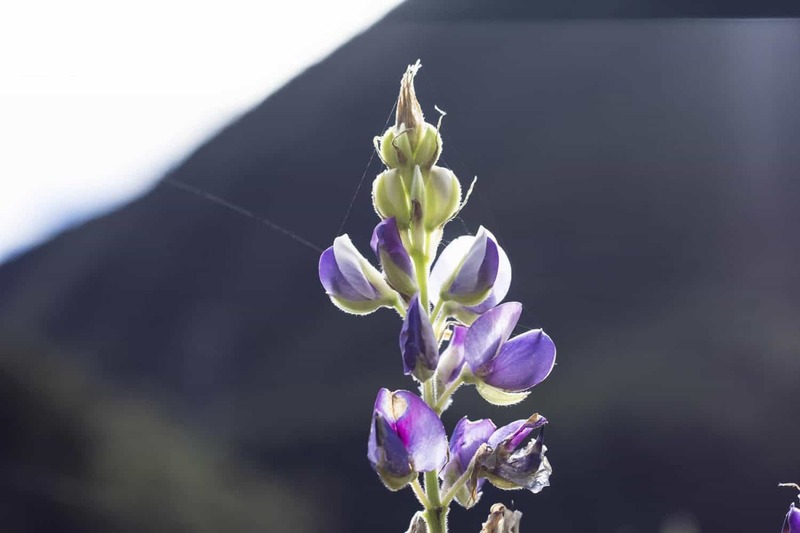 Today we continue our trek 2h up to the highest point on the Classic Inca Trail, the Abra Warmihuañusca or Dead Woman’s Pass. Coming in at a still-impressive 4200m / 13,779 ft, we can feel proud that we’ve already attained even higher altitudes. Immediately after the pass, we descend into the Pacaymayo valley (3600m / 11,811 ft), from which we then continue to climb to the second pass, the Abra Runkurakay (3760m / 12,335ft), stopping halfway to visit the very impressive archaeological complex of the same name. This site, located at 3800m / 12,467ft, consists of a small oval structure that is believed to have been used as a watchtower. After going over this pass, we descend towards Yanacocha (Black Lake) and enter the cloud forest to finally arrive at Sayacmarca (3624m/11,889 ft). This is a beautiful semicircular complex. Only 20 minutes away is Chaquicocha (“dry lake” in Quechua, 3600m / 11,811ft), where we will camp for the night. After breakfast we have an easy climb to the third pass, the Abra de Phuyupatamarca (3700m/12,139ft). Located on the highest point of the mountain, Phuyupatamarca (“town above the clouds”) is one of the most complete and best-preserved archaeological complexes along the Inca Trail to Machu Picchu. From here we also have impressive views of the Urubamba River Valley below. We descend by stone steps to Wiñaywayna (2650m/8,694ft), the campsite is just five minutes away from another archaeological complex of the same name. Wiñaywayna is an impressive site made up of an agricultural center with numerous terraces, a religious sector, and an urban sector – even if you are tired and enjoying the relative luxury of this campsite, don’t miss this incredible site! Our final morning will be an early one as we rise at 3:30 am in order to leave Wiñaywayna by 5:30 am to go to the checkpoint and make our way to Inti Punku, the Sun Gate (2730m / 8,956 ft). This will take an hour of hiking along a trail of flat stones on the edges of cliffs in highland jungle. 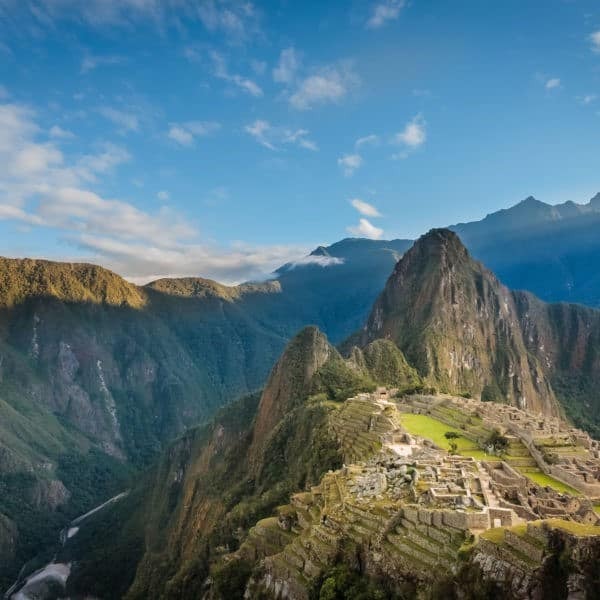 At this fabulous spot, we may see the sun rise over Machu Picchu. From Inti Punku we descend into Machu Picchu through the control point where we register ourselves and leave our backpacks and then we enter this famous city. Your 4h visit to Machu Picchu can be spent exploring some of the alternative routes, like the Inca Bridge, after which your guide will give you a 2-3h walking tour of the historic citadel. The trek exceeded my expectations! Campsite #1 was the highlight of the trek, sleeping beneath Apu Salkantay. Our guide was great, helpful, knowledgeable and well informed. It has taken me three attempts to make it to Peru for the Salkantay-Inka Trail. I had organised a larger group the first time and the feedback from those people about Apus Peru was, without exception, excellent. Apus Peru is a relatively small organisation amongst a forest of tour megaliths. It feels and works like a small community. Our sales representative answered every one of my pesky emails during the months leading up to our trek and, when we met, gave us all the time we needed for our questions. We were a small group of two walkers and Apus sent nine people to care and carry for us. The porters all came from the same small village and had been with Apus for many years. They were always cheerful and each one kept a quiet eye out for us. Our guide stuck with me (the slow one) for all the seven days and made sure I came through looking good. Our chef worked miracles in his tent kitchen. Apus Peru did a great job. Thank you, Apus. It is hard to express in words our experience trekking as a family of 4 from Mollepata, up to Abra Salkantay down to Pampa Cahuana and then on to the Inca Trail to Machu Picchu. The communication with our travel consultant from Apus Peru was thorough and always prompt right from the start of my inquiries. I had a good feeling about this local outfitter right from the start. This would be our family’s first multi-day backpacking trek but with camping, hiking and strong fitness, we were confident in our kids’ abilities to tackle the trail. We then began our private trek for the 6 days along with our guide. The first two days we had horses along with our chef and sous chef and then porters for the Inca Trail portion. Our guide was a fantastic guide for our family. He is calm but intuitive, very knowledgeable about history and current events both in Peru and globally so we had some great conversations. He was able to anticipate our pacing which enabled us to move faster through the trail and get to camp early rather than stop for extended lunches in the latter part of the trek which was great as we then had lots of time at camp to eat, read, play soccer and eat again! And the food…our chef and sous chef were incredible! We are a vegan/vegetarian family and our guide joined us in this! We miss these meals every day now that we are home! We even had real coffee (not nescafe) done on the burner with a large espresso maker. We tackled the Salkantay climb and descent the first two days which was the highlight of our trek – the beauty, peace, and challenge was awesome. We covered 34 kms and got up to 5000m and back down to just over 3000m in those two days. Inca Trail was great to do as well. The only busy campground, really, was the last one as we were still early season. Weather co-operated for us (some light rain) and the bugs were minimal. We ended at Machu Picchu and Wayna Picchu climb (which seemed easy after the prior 5 days!). While we appreciated everything that is Machu Picchu, we had seen so many lessor but equally interesting and quiet ruins that it was almost strange to be seeing this amongst 2500+ other people. Our guide guided us through some interesting elements (not all the touristy ones) and left us to hike Wayna Picchu. We capped off the day in Aguas Calientes and then Vistadome train back (recommend upgrading the train for sure). Another 2 hrs in the van to Cusco which made for a long day but worth it. We will book again through Apus Peru – likely my husband and I would do a longer, more remote trek in the future. Peru is a beautiful place to visit with excellent food for vegans.